New! DVD Photo Slideshow 7.97 fixes some bugs. Make photo DVD disc and create photo slideshow for TV, MPEG, Web. Add photos from your hard drive or any other digital devices to your album. 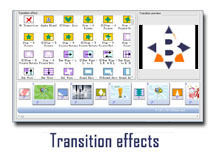 Customize your desired transition effects and background music to the selected album. Choose an album theme, which makes the overall appearance of your album more animated, to apply to your album. Have a preview of your creative slideshow so as to make any desired modifications. You add your favoraite background music to the slide show. You can also trim the audio file or add music from Audio CD or even recorde your own voice. You select what kind of transitions you want between photos. These are top notch and there are dozens to choose from. Download a free trial version and show photos on TV! Configure your favorite DVD menu which will be a navigator when you enjoy your slideshows on TV. Select a desired menu template from our built-in menu templates. Modify the menu appearance by adding background music and changing background music and layout. Preview your show in menu mode, which is same to its appearance when it is played with DVD player. Set the related technical parameters before your burning. Save any extra files on your burned disc as you like. Enjoy your amazing slideshow on the big-screen TV with your families and friends to share your great memories.